It is a sad new tradition that at the start of PMQs tribute is paid to fallen soldiers. 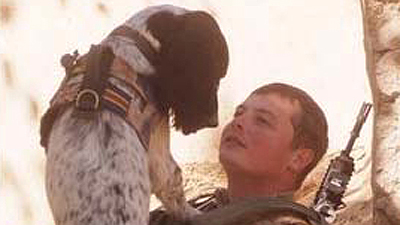 Lance Corporal Liam Tasker, of the First Military Working Dog Regiment, the Royal Army Veterinary Corps, was killed by small arms fire on patrol with his dog in Helmand Province on Tuesday of last week. His springer spaniel, Theo, suffered a seizure shortly afterwards and died. The British are very sentimental about dogs and combined with the death of young Lance Corporal Liam Tasker, who was flown back from Helmand with Theo, this story touched the hearts of many. On Wednesday at PMQs he was given the customary and deserved tribute by the PM and the leader of the opposition. The Speaker in this situation often gives priority to the constituency MP of the fallen hero to say a few words of comfort. No such comfort was offered on this occasion. Liam Tasker was born in Kirkcaldy.